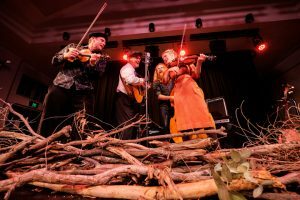 Making a return visit to Cobargo, The Black Mountain String Band is a celebration of string band music in all its forms. They combine fiddles and banjos along with guitar and double bass to draw from the well of tradition, while adding timeless sounding originals. Donal Baylor, Jacqueline Bradley, Matt Nightingale and Pablo Shopen- who’s father pioneered old time picking in Canberra with his band of the same name in the 1980s – cleverly arrange this wide range of material in a seamless presentation and will delight aficionados and new audiences alike..